GOLD PRICES held just below yesterday’s 5-week high in London Wednesday morning, trading near $1240 per ounce as Asian and European stock markets extended Wall Street’s steep drop amid forecasts of a US economic recession after the yield curve on Washington’s debt briefly inverted. China’s politburo in Beijing meantime expressed “confidence” over reaching a new trade deal with the United States during the 90-day delay to new import tariffs agreed by presidents Xi and Trump at the G20 summit last weekend. “China does not want Tariffs!” Trump tweeted overnight – also retweeting a comment that fuel-tax protesters in France are allegedly chanting “We want Trump” as part of a “middle class rebellion against cultural Marxism”, exemplified by the Paris climate accord. Monday saw 2-year US Treasury bond yields rise above 5-year yields, suggesting that the market sees interest-rate cuts ahead. But the more closely-watched 10-versus-2 year spread remains positive. From this time last month, betting on the US Federal Reserve raising its key rate 3 times or more by end-2019 has now halved according to data from futures exchange the CME, falling from 59.1% of speculative positions to just 30.0% last night. 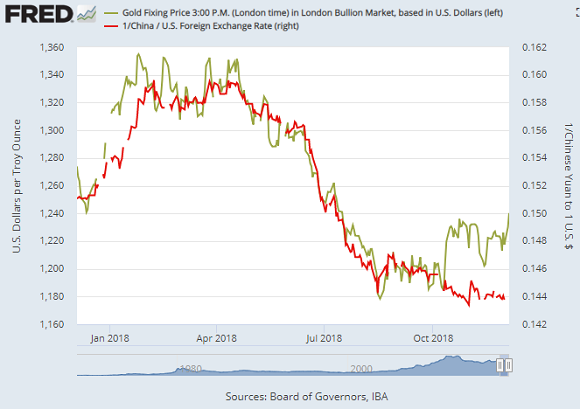 Having closely tracked the Chinese Yuan’s exchange-rate to the US Dollar all through 2018, gold prices have risen as the Yuan fell since October, extending that split so far in December. The Yuan this morning rose to 14.64 US cents. Gold would today stand nearer $1200 per ounce if 2018’s correlation with the CNY hadn’t snapped. “[The] US-China trade war is a source of market anxiety and, therefore, potential support for gold and silver prices,” says Australian bank Macquarie’s commodities team. Euro gold prices meantime edged back above €1090 per ounce on Wednesday after reaching that 6-week high yesterday even as the European Commission said Italy’s left-right coalition “is now willing to listen to our point of view” about cutting its 2019 budget deficit plans. Over in London Theresa May’s Government was defeated 3 times in the House of Commons on Tuesday, forcing it to publish private legal advice and to accept a greater role for Parliament in renegotiating Brexit should May’s deal be rejected by lawmakers in next week’s key vote. Some pundits see that as opening the door to the UK cancelling Article 50 and remaining in the European Union – a move it could make unilaterally, without needing the other 27 EU states to agree, according to legal advice from the European Court of Justice. The UK gold price in Pounds per ounce today retreated to £969 after hitting its highest since mid-June on Tuesday at £977. Silver prices on Wednesday fell back to $14.48 after hitting 4-week highs above $14.60 per ounce. Platinum meantime traded back below $800 while sister-metal palladium leapt yet again, spiking to $1260 per ounce and overtaking gold prices for the first time since 2003 according to Bloomberg.